The new codex for the Chaos Space Marines has inspired the need to start a new force, something different from my Necrons. I really like the new background of Chaos warbands, so I decided to work along those lines - a group of warbands, temporarily united under a warleader. They were supposed to be like the Night Stalkers in the new codex, but I could not figure out how to replicate the look. 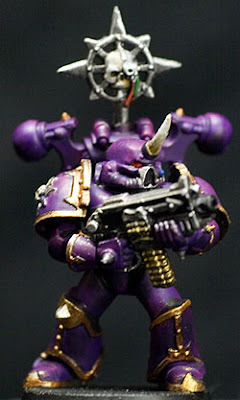 So instead I just worked with the original purple shade colour and did some highlighting and further shading.